Congresswoman Judy Biggert spent Friday morning, August 12, 2011, touring Village of Downers Grove facilities to review several of the Village's innovative, environmental sustainability projects. Mayor Martin Tully and Congresswoman Biggert, together with Village staff, visited several locations including the Prentiss Creek Neighborhood, to see the solar and wind powered streetlights. 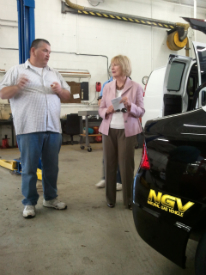 Other stops included a look at the energy efficient lighting in the Downtown Parking Deck and the Fleet Maintenance Facility to see some alternative fuel vehicles which make up over 77% of the Village's fleet. Also featured on the tour were newly installed solar powered heating panels, the nitrogen tire filling station and the system used to convert vegetable oil to biodiesel fuel in the fleet garage. Read the 2011 Environmental Sustainability Report for more on these exciting and innovative Village projects.